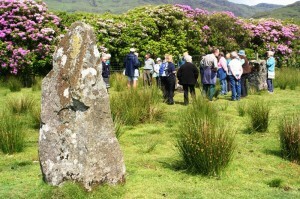 MH&AS and Morvern Heritage Society members join for a visit to the standing stones at Lochbuie. The subscription is only £10.00 per year for both UK and overseas members. You can fill in our printable form – MH&AS Membership Form – and post it to the Membership Secretary along with your Sterling cheque. or you can pay by standing order: Standing Order Mandate Form Please print and send the completed Mandate to the Membership Secretary (see below). This is a good option as we can be sure of a secure income for the Society and it saves time, too! Alternatively, you can subscribe through Paypal with either your credit card or Paypal account by clicking the ‘Subscribe’ button.